"The history of transport matches the evolution of the engine and the associated driving systems. These days saving energy and reducing polluting emissions are the main objectives of research. 'A new challenge to make more cost-efficient engines has been launched in Europe. How does this technology work and how will it integrate in our daily life?" reports Euronews correspondent, Claudio Rosmino in this edition of Futuris. A fleet of a new generation of hybrid vehicles, made in Europe, will arrive in five different segments to the automotive market in the next few years. Hybrid vehicles combine an internal combustion engine and an electric motor that assists the conventional engine, allowing the increase of fuel efficiency and the reduction of CO2 emissions. "Hybrid vehicles are the next step in the move to have low emission mobility in Europe.The key points in this project are: the collaboration between light-duty vehicle manufacturers and heavy-duty vehicle manufactures; then, we have also been working on the standardisation of heavy-duty hybrid electric components, making them more easy [sic] and cost-effective to integrate," explained Guus Arts, ECOCHAMPS Project Coordinator and mechanical engineer, Daf. The ECOCHAMPS consortium (European Competitiveness in Commercial Hybrid and AutoMotive PowertrainS) consists of 25 partners, from eight European countries, as vehicle manufacturers (from cars to trucks and buses), component suppliers and research institutes. Their work has been focusing on a high level of standardisation of the components and synergies among the different vehicle types. "Thanks to the use of large-scale produced components, this technology will help to reduce the extra cost of hybridization by two; we hope to be able to have a massive diffusion and contribute to the reduction of CO2 emissions," Claudi Lehongre, electronics engineer, Renault pointed out. The main challenges for this EU funded project are the improvement of engine efficiency - up to 20%, and the reduction of costs of hybrid vehicles (only 10% more than common models), passenger cars and also commercial vehicles, which are the most complicated to adapt. "Here with the heavy-duty truck, 40/50 tons total weight, we have a (lifetime) mileage of 1.6 million km. The requirements on the components are much higher. 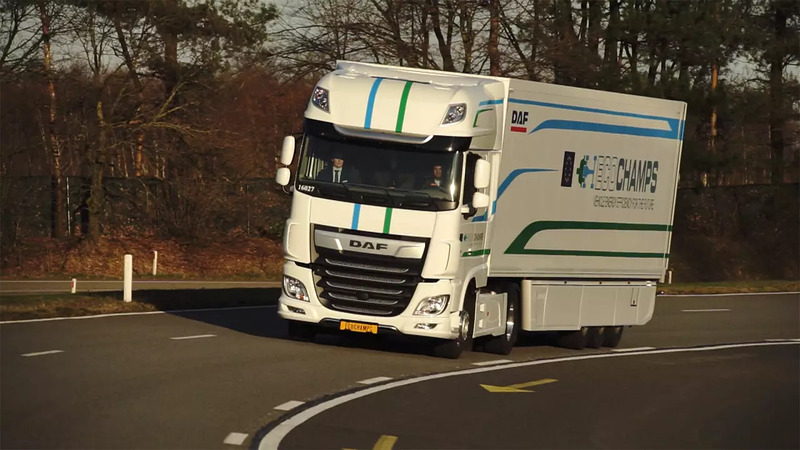 Getting the components out of the passenger car industry and inserting them in a heavy duty application, is a tough challenge," said Bart Lipsch, mechanical engineer, Daf. One of the principles of the hybrid system is related to the possible recovery of mechanical energy in order to produce electricity. With the example of the truck, for instance, it happens by exploiting the braking system. The truck driver has the opportunity to switch the commercial vehicle driving system from hybrid to electric, a feature which is particularly suitable for urban driving. "This vehicle's uniqueness is that it can work in hybrid mode if you are driving on extra-urban roads and motorways, or in full electric mode, if you are using it in a city centre which may have areas limited to traffic," said Roberto Manitia, electronic engineer, Iveco. Hybrid vehicle diffusion is still relatively low in Europe, but the forecasts are quite promising for this sector, which is expected to be boosted by more eco-sustainable policies and the reduction of the costs of batteries and production.